Q. How long does it take to get my baskets after I place my order? 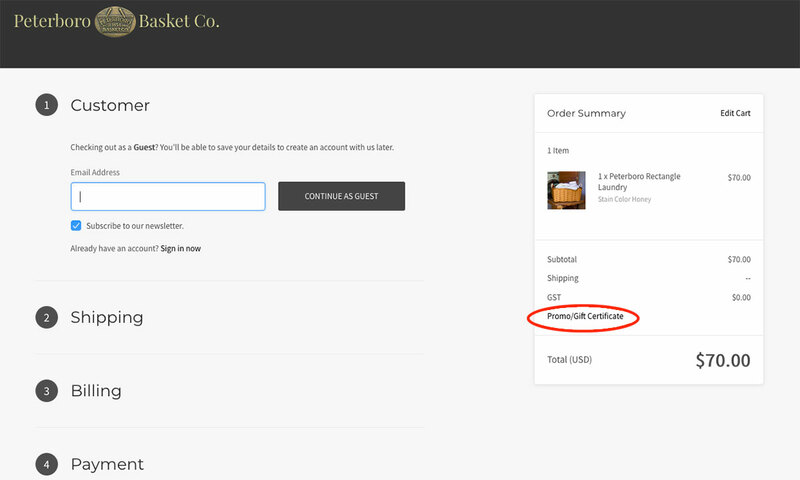 Our products are made to order (inventory is put on the website in order for us to know how many of each item needs to be handcrafted), so please allow 5-15 BUSINESS DAYS (excludes Saturdays, Sundays, and holidays) for us to handcraft your baskets. In addition to the manufacturing time, you must be allow for transit time from our factory in NH to the final destination. Most orders are shipped via UPS Ground and arrive within 7 BUSINESS DAYS from when the goods leave our loading dock. When ordering, please specify under “Order Notes” any special instructions if your order must be delivered by a specific date. Not sure your purchase will arrive in time? Please contact us at 1-800-555-3919 and we may be able to expedite your order. Online discount Coupon codes and Gift Certificates are applied at checkout before your payment is made. For laptop users, after you make your product selections, and “add to cart”, you have options. 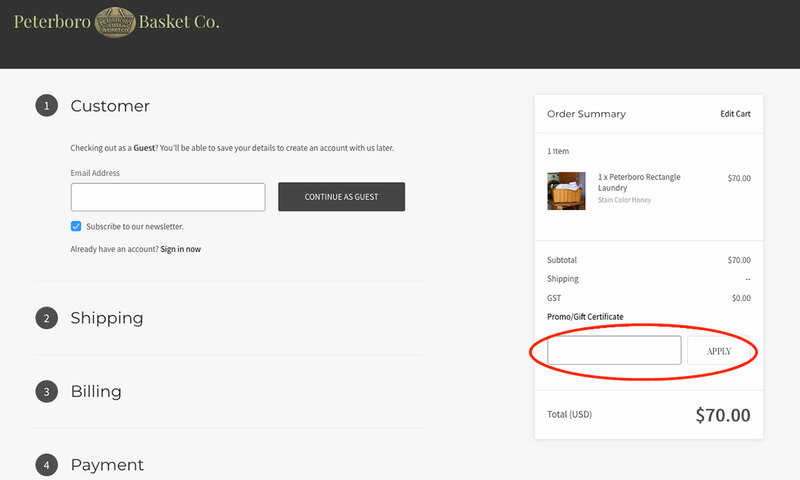 One option, “Proceed to Checkout,” brings you a page that allows you to input your information. On the right is a summary of your cart with a line that reads “Promo/Gift Certificate”. Clicking on this line will give you a field to input your code. Click apply and your total should reflect your discount. Otherwise you'll be instructed to double-check your code. 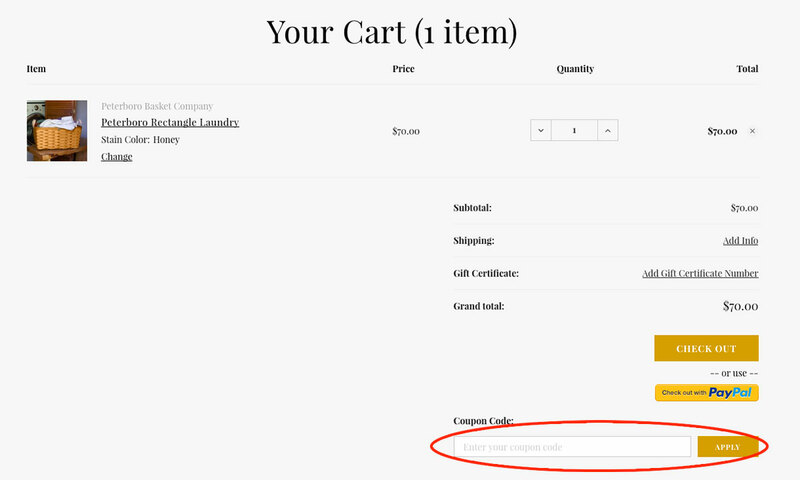 Another option allows you to “View your cart”. clicking on this link brings you to a page where, in the lower right corner, you can input and apply your coupon code. Click apply and your total should reflect your discount. Otherwise you'll be instructed to double-check your code. Q. Can I ship to a different address than mine? Yes we have the option that allows you to ship to multiple addresses. Q. Where on the baskets are personalization plaques attached? Depending on the basket, personalization plaques when available, are placed on the lid, the strapping, or the handle of the basket. When placed on the lid, the plaque is usually centered considering the need for the the lids to lay flat when opened. When placed on the strapping or handles, convenience of carrying is considered as well as the shape of the basket pieces to ensure the most secure attachement. Q. How do I order gift wrapping? Q. Do you sell your baskets wholesale? Yes. Go to https://www.peterborobasket.com/peterboro-basket-wholesale/ for more information. Q. Where can I buy your baskets? Peterboro Baskets can be purchased right here on our website, by calling 1-800-555-3919, or in our Factory Outlet Store. Q. What are your Factory Outlet store hours? The Peterboro Basket Company Factory Outlet Store hours are Monday thru Saturday 9 am – 5 pm & Sunday 11 am – 5 pm. Closed most Holidays. Q. What are Peterboro Baskets made of? Our baskets are made from Appalachian White Ash. The same hardwood that baseball bats, snowshoes and axe handles are made from. The wood is harvested from Maine, Vermont and New Hampshire. We use solid brass nails to prevent any rusting and all of our hardware is brass coated. Our baskets are made to last, this is why we are able to offer our limited lifetime warranty. Q. Where are your baskets made? All of our baskets are made on site at our factory in Peterborough, NH. We are the oldest basket manufacturing company still crafting our baskets right here in the United States. We are proud to be a 100% made in the U.S.A. company. We are not a home party based company. We sell direct to the end user so that you are getting the very best price. You can purchase our baskets on our website, via phone, or by visiting our Factory Outlet Store in Peterborough, NH. Q. What is the best way to clean your baskets?